Two hundred forty swimmers dove into outer New Bedford Harbor early Saturday morning to celebrate clean water in Buzzards Bay during the 23rd annual Buzzards Bay Swim. Dan Vasconcellos of Pembroke swam in his 20th Buzzards Bay Swim in memory of his father, Arthur. As of the start of the event Saturday, swimmers had raised $120,000 to support the Coalition’s work to protect clean water, conserve land, and educate youth and adults across the Buzzards Bay region. You can still support the swim by donating online. Calm, clear waters and bright sunshine greeted swimmers as they gathered at The Edge Seafood & Lounge beach in New Bedford’s South End. The first swimmers started at 7:15 a.m., and around 9:00 a.m. the final swimmers had covered the 1.2-mile course and arrived at the finish line at Fort Phoenix Beach State Reservation in Fairhaven. The Swim drew participants from 120 communities in 15 states, including as far as away as Alaska, Washington, and Florida. Swimmers ranged in age from 12 to 76. First-time Buzzards Bay Swim participant and New Hampshire resident Peggy Chisholm grew up in Padanaram, and she swims in Buzzards Bay when she visits southeastern Massachusetts on weekends. “I love these waters,” she said after crossing the finish line. Larry Fish of Falmouth was the top fundraiser this year, raising $5,000. Bill Muldoon of Mattapoisett raised $3,506, while Dan Vasconcellos of Pembroke raised $2,900 in memory of his father, Arthur. Rebecca Williams of Rochester was the top fundraiser for a new swimmer, raising $2,420. In addition to the top individual fundraisers, the Red Dory Restaurant of Tiverton, R.I. was the top fundraising team with a total of $4,026. After the Swim, participants, volunteers and supporters enjoyed a finish line beach party with a pancake breakfast, complimentary massages, live music from El Caribe, and a live radio broadcast with Michael Rock of FUN 107. The event concluded with an awards ceremony. Fifteen-year-old Henry Keegan of Needham was the top finisher, completing the course in 22 minutes and 40 seconds. Eric Pauls of Westport came in second with a time of 22 minutes and 58 seconds. In third place was Frank Wuest of Boston with a time of 24 minutes and 10 seconds, a tie with the top overall female finisher, Morgan McCarthy of East Orleans. The Wheeler Watershed Challenge Cup for the fastest team went to the “Salty Sea Dogs” (Alex Gallant of Lakeville, Nick Graca of East Freetown, and Trevor Ragas of Lakeville) with an average team time of 25 minutes and 51 seconds. The Quicks Awards for the fastest youth teams both went to MetroWest Aquatic Club. The boys’ team (Henry Keegan, 15, of Needham, Samuel Dawley, 15, of Dover, and Benjamin Zeng, 14, of Weston) finished with an average time of 25 minutes and 12 seconds. The girls’ team (Molly Jordan, 14, of Mendon, Charlotte Moynihan, 14, of Needham, and Riley Correll, 15, of Dover) finished with an average time of 29 minutes and 51 seconds. The two teams will each bring a $500 prize back to their swim club. 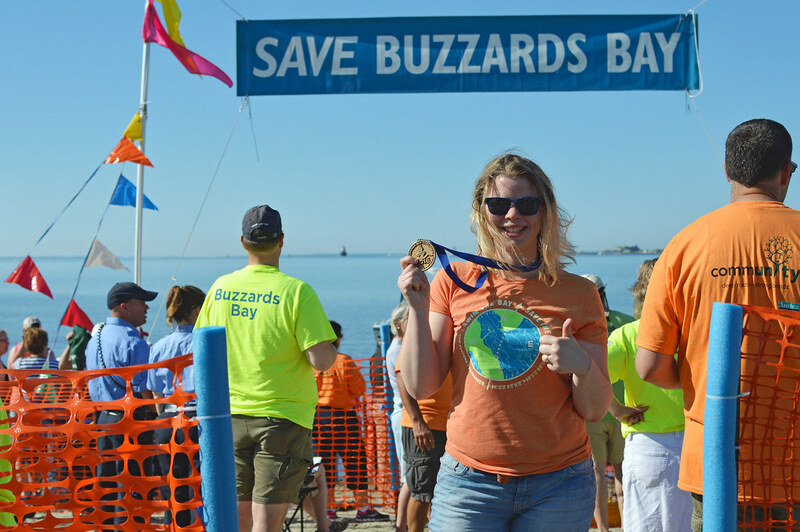 For a full list of results from the 2016 Buzzards Bay Swim, visit www.savebuzzardsbay.org/swim. The Buzzards Bay Swim is a Waterkeeper Alliance SPLASH Series event, presented by Toyota. For more information, please visit www.splashseries.org. The Swim is also sponsored by Amica Insurance, Anderson Insulation, Citizens Commercial Banking, Fiber Optic Center and Whaling City Sound.